LitRef: Selective cyclooxygenase-2 (COX-2) inhibitor. Prepn: Y. Ducharme et al., WO 9500501; eidem, US5474995 (both 1995 to Merck Frosst). Rofecoxib /ˌrɒfɨˈkɒksɪb/ is a nonsteroidal anti-inflammatory drug (NSAID) that has now been withdrawn over safety concerns. It was marketed by Merck & Co. to treat osteoarthritis, acute pain conditions, and dysmenorrhoea. Rofecoxib was approved by the Food and Drug Administration (FDA) on May 20, 1999, and was marketed under the brand names Vioxx, Ceoxx, and Ceeoxx. On September 30, 2004, Merck withdrew rofecoxib from the market because of concerns about increased risk of heart attack and stroke associated with long-term, high-dosage use. Merck withdrew the drug after disclosures that it withheld information about rofecoxib’s risks from doctors and patients for over five years, resulting in between 88,000 and 140,000 cases of serious heart disease. Rofecoxib was one of the most widely used drugs ever to be withdrawn from the market. In the year before withdrawal, Merck had sales revenue of US$2.5 billion from Vioxx. Merck reserved $970 million to pay for its Vioxx-related legal expenses through 2007, and have set aside $4.85bn for legal claims from US citizens. Cyclooxygenase (COX) has two well-studied isoforms, called COX-1 and COX-2. COX-2 mediates the synthesis of prostaglandins responsible for pain and inflammation. By creating “selective” NSAIDs that inhibit COX-2, but not COX-1, the same pain relief as traditional NSAIDs is offered, but with greatly reduced risk of fatal or debilitating peptic ulcers. 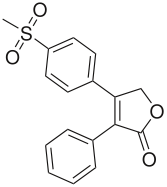 Rofecoxib is a selective COX-2 inhibitor, or “coxib”. Others include Merck’s etoricoxib (Arcoxia), Pfizer’s celecoxib (Celebrex) and valdecoxib (Bextra). Interestingly, at the time of its withdrawal, rofecoxib was the only coxib with clinical evidence of its superior gastrointestinal adverse effect profile over conventional NSAIDs. This was largely based on the VIGOR (Vioxx GI Outcomes Research) study, which compared the efficacy and adverse effect profiles of rofecoxib and naproxen. The therapeutic recommended dosages were 12.5, 25, and 50 mg with an approximate bioavailability of 93%. Rofecoxib crossed the placenta and blood–brain barrier,and took 1–3 hours to reach peak plasma concentration with an effective half-life (based on steady-state levels) of approximately 17 hours. The metabolic products are cis-dihydro and trans-dihydro derivatives of rofecoxib which are primarily excreted through urine. On March 11, 2009, Scott S. Reuben, former chief of acute pain at Baystate Medical Center, Springfield, Mass., revealed that data for 21 studies he had authored for the efficacy of the drug (along with others such as celecoxib) had been fabricated in order to augment the analgesic effects of the drugs. There is no evidence that Reuben colluded with Merck in falsifying his data. Reuben was also a former paid spokesperson for the drug company Pfizer (which owns the intellectual property rights for marketing celecoxib in the United States). The retracted studies were not submitted to either the FDA or the European Union’s regulatory agencies prior to the drug’s approval. Drug manufacturer Merckhad no comment on the disclosure. The VIGOR (Vioxx GI Outcomes Research) study, conducted by Bombardier, et al., which compared the efficacy and adverse effect profiles of rofecoxib and naproxen, had indicated a significant 4-fold increased risk of acute myocardial infarction (heart attack) in rofecoxib patients when compared with naproxen patients (0.4% vs 0.1%, RR 0.25) over the 12 month span of the study. The elevated risk began during the second month on rofecoxib. There was no significant difference in the mortality from cardiovascular events between the two groups, nor was there any significant difference in the rate of myocardial infarction between the rofecoxib and naproxen treatment groups in patients without high cardiovascular risk. The difference in overall risk was by the patients at higher risk of heart attack, i.e. those meeting the criteria for low-dose aspirin prophylaxis of secondary cardiovascular events (previous myocardial infarction, angina, cerebrovascular accident, transient ischemic attack, or coronary artery bypass). The editors charged that “more than four months before the article was published, at least two of its authors were aware of critical data on an array of adverse cardiovascular events that were not included in the VIGOR article.” These additional data included three additional heart attacks, and raised the relative risk of Vioxx from 4.25-fold to 5-fold. All the additional heart attacks occurred in the group at low risk of heart attack (the “aspirin not indicated” group) and the editors noted that the omission “resulted in the misleading conclusion that there was a difference in the risk of myocardial infarction between the aspirin indicated and aspirin not indicated groups.” The relative risk for myocardial infarctions among the aspirin not indicated patients increased from 2.25 to 3 (although it remained statitistically insignificant). The editors also noted a statistically significant (2-fold) increase in risk for serious thromboembolic events for this group, an outcome that Merck had not reported in the NEJM, though it had disclosed that information publicly in March 2000, eight months before publication. In 2001, Merck commenced the APPROVe (Adenomatous Polyp PRevention On Vioxx) study, a three-year trial with the primary aim of evaluating the efficacy of rofecoxib for theprophylaxis of colorectal polyps. Celecoxib had already been approved for this indication, and it was hoped to add this to the indications for rofecoxib as well. An additional aim of the study was to further evaluate the cardiovascular safety of rofecoxib. The APPROVe study was terminated early when the preliminary data from the study showed an increased relative risk of adverse thrombotic cardiovascular events (includingheart attack and stroke), beginning after 18 months of rofecoxib therapy. In patients taking rofecoxib, versus placebo, the relative risk of these events was 1.92 (rofecoxib 1.50 events vs placebo 0.78 events per 100 patient years). The results from the first 18 months of the APPROVe study did not show an increased relative risk of adverse cardiovascular events. Moreover, overall and cardiovascular mortality rates were similar between the rofecoxib and placebo populations. Any increased risk of renal and arrhythmia pathologies associated with the class of COX-2 inhibitors, e.g. celecoxib (Celebrex), valdecoxib (Bextra), parecoxib (Dynastat),lumiracoxib, and etoricoxib is not evident, although smaller studies had demonstrated such effects earlier with the use of celecoxib, valdecoxib and parecoxib. On November 5, the medical journal The Lancet published a meta-analysis of the available studies on the safety of rofecoxib (Jüni et al., 2004). The authors concluded that, owing to the known cardiovascular risk, rofecoxib should have been withdrawn several years earlier. The Lancet published an editorial which condemned both Merck and the FDA for the continued availability of rofecoxib from 2000 until the recall. Merck responded by issuing a rebuttal of the Jüni et al. meta-analysis that noted that Jüni omitted several studies that showed no increased cardiovascular risk. (Merck & Co., 2004). In 2005, advisory panels in both the U.S. and Canada encouraged the return of rofecoxib to the market, stating that rofecoxib’s benefits outweighed the risks for some patients. The FDA advisory panel voted 17-15 to allow the drug to return to the market despite being found to increase heart risk. The vote in Canada was 12-1, and the Canadian panel noted that the cardiovascular risks from rofecoxib seemed to be no worse than those from ibuprofen—though the panel recommended that further study was needed for all NSAIDs to fully understand their risk profiles. Notwithstanding these recommendations, Merck has not returned rofecoxib to the market. In 2005, Merck retained Debevoise & Plimpton LLP to investigate Vioxx study results and communications conducted by Merck. Through the report, it was found that Merck’s senior management acted in good faith, and that the confusion over the clinical safety of Vioxx was due to the sales team’s overzealous behavior. The report that was filed gave a timeline of the events surrounding Vioxx and showed that Merck intended to operate honestly throughout the process. Any mistakes that were made regarding the mishandling of clinical trial results and withholding of information was the result of oversight, not malicious behavior….The report was published in February 2006, and Merck was satisfied with the findings of the report and promised to consider the recommendations contained in the Martin Report. Advisers to the US Food and Drug Administration (FDA) have voted, by a narrow margin, that it should not ban Vioxx — the painkiller withdrawn by drug-maker Merck. They also said that Pfizer’s Celebrex and Bextra, two other members of the family of painkillers known as COX-2 inhibitors, should remain available, despite the fact that they too boost patients’ risk of heart attack and stroke. url = http://www.nature.com/drugdisc/news/articles/433790b.html The recommendations of the arthritis and drug safety advisory panel offer some measure of relief to the pharmaceutical industry, which has faced a barrage of criticism for its promotion of the painkillers. But the advice of the panel, which met near Washington DC over 16–18 February, comes with several strings attached. For example, most panel members said that manufacturers should be required to add a prominent warning about the drugs’ risks to their labels; to stop direct-to-consumer advertising of the drugs; and to include detailed, written risk information with each prescription. The panel also unanimously stated that all three painkillers “significantly increase the risk of cardiovascular events”.